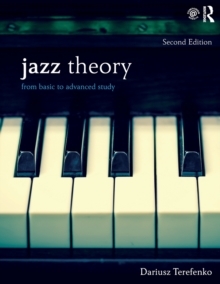 Jazz Theory: From Basic to Advanced Study, Second Edition, is a comprehensive textbook for those with no previous study in jazz, as well as those in advanced theory courses. Written with the goal to bridge theory and practice, it provides a strong theoretical foundation from music fundamentals to post-tonal theory, while integrating ear training, keyboard skills, and improvisation. It hosts "play-along" audio tracks on a Companion Website, including a workbook, ear-training exercises, and an audio compilation of the musical examples featured in the book. 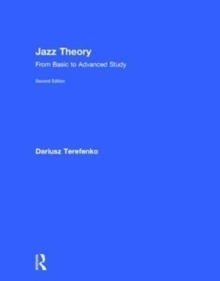 Jazz Theory is organized into three parts: Basics, Intermediate, and Advanced. This approach allows for success in a one-semester curriculum or with subsequent terms. If students sense that theory can facilitate their improvisational skills or can help them develop their ears, they become more engaged in the learning process. The overall pedagogical structure accomplishes precisely that in an original, creative-and above all, musical-manner. KEY FEATURES include 390 musical examples, ranging from original lead sheets of standard tunes, jazz instrumentals, transcriptions, and original compositions, to fully realized harmonic progressions, sample solos, and re-harmonized tunes. The completely revamped Companion Website hosts:46 "Play Along Sessions" audio tracks, offering experiences close to real-time performance scenarios. Over 1,000 (audio and written) exercises covering ear training, rhythm, notation, analysis, improvisation, composition, functional keyboard, and others. Recordings of all 390 musical examples from the textbook. Links: Guide to Making Transcriptions, List of Solos to Transcribe, Selected Discography, Classification of Standard Tunes, and more. Lists of well-known standard tunes, including a comprehensive list of 999 Standard Tunes - Composers and Lyricists. NEW TO THE SECOND EDITION are instructors' tools with answer keys to written and ear-training exercises, 380 rhythmic calisthenics featuring exercises from the swing, bebop, and Latin rhythmic traditions, a new improvisation section, a set of 140 Comprehensive Keyboard exercises, plus an expanded ear-training section with 125 melodic, 50 rhythmic dictations, and 170 harmonic dictations, plus 240 written exercises, 25 composition assignments, and 110 singing exercises.